The H.Upmann Coronas Major Tubos is an affordable and mild Habano, with 42 ring gauge, 5.2” (132mm) long and comes in a box of 25 cigars in tubes. This is a gentle smoke that is both very complex and smooth, lots of cedar, spices, coffee. It is really a delicate vitola that can be enjoyed by all cigar enthusiasts, as it remains accessible while not being that expensive. To top it all, its construction is great, and the fact that it comes in an elegant aluminum tube makes it a cigar easy to carry around. The H.Upmann Coronas Major Tubos is a very good cigar for a long break and which remains easy on the wallet. • Mild to medium cigar, with lots of complexity, the right amount of spices and a delicious long finish. • Great potential for aging. Keep it aside for 4-5 years to find an even creamier and smoother cigar. This cigar is simply a winner thanks to its price and its convenient packaging. The cigar comes in a beautiful aluminum tube of yellow/cream color. Once the tube opened, it reveals a nice and well rolled cigar. The wrapper has a light brown color (claro tone), a few apparent veins and some tiny bumps here and there, but overall, it is good. It feels packed evenly from the cap to the foot. The cap is very well applied. At cold, the cigar smells of strong barnyard and of sweet tobacco. The cap cuts easily and then reveals a good draw, which is perhaps just slightly firm. The cold draw gives some wood and chocolaty flavors. The H Upmann Coronas Major lights easily and the first flavors to reach the palate are of cedar, leather and coffee. The burn line is perfect throughout the whole smoke. The ash builds up at the foot and holds on for almost 2 inches. Right away the cigar releases generous billows of thick and creamy white smoke. The first third of the cigar starts of very mildly with some smooth flavors of cedar, black coffee and leather. There is also a strong note of tobacco, but not overpowering the rest of the flavors. It is all tied-up nicely thanks to some delightful hints of spices. The finish is long and beautiful. There are also some notes of vanilla and of sweetness (honey). Strength wise, it is at a mild-to-medium smoke at this point. In the middle third, the cigar is still very creamy, offering ample cedar, still plenty of coffee and leather. The spice has receded to the background, it is a very enjoyable third, complex and creamy. 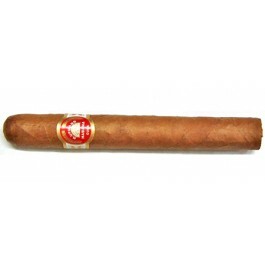 The body of the cigar remains in the mild-to-medium range, slowly increasing in power since the first third. In the final third, the flavor profile changes significantly, even if the cedar is still predominant, the coffee and the leather have completely disappeared, and leaves place for ample floral characteristics. The honey sweetness is also quite present through the nose. The finish is still very long and chocolaty. It is a incredibly delicious ending to the cigar, all the flavors work beautifully together, and the Coronas Major remains cool until the last inch. In summary, this is an affordable cigar that presents a beautiful and consistent construction in a long and enjoyable smoke experience.